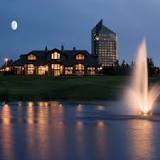 Grand Traverse Resort & Spa, a four-season destination resort, dining and meeting place located in Traverse City. The resort is also home to Aerie Restaurant & Lounge offering a 16th-floor panorama of East Bay and regional fine dining. Music on weekends. Click on each restaurant for hours and menus.